Yes, it’s a Monday and I’m posting about my cats. Its been just about two months since we moved the kittens over to the new house and it’s been quite the adventure thus far. I’ll admit, it’s been a long time since I actually lived with kittens. My family has lots of cats outside, but there’s a difference between living in a house with kittens and going out to see them once in a while. I was at college for most of their current indoor cat’s kitten hood so the last time I was in the house with a kitten was Mushu back in high school, and before him Smokey and Spot when I was probably eight-ish. So if you weren’t aware, kittens are full of energy, all the time. They basically have two modes: asleep, and attack. They will occasionally take snuggle breaks, but mostly they run rampant around the house, killing fuzzies at will, and the occasional spider. They will also attack anything that dangles or that might move slightly. While they are very cute and sometimes it’s kind of adorable how they play with everything it’s also a little annoying when you find the cord to the blinds ripped down and laying in the middle of the living room. I’ve accepted the fact that my shoes probably won’t stay in the same place for long. My kittens are also very vocal. 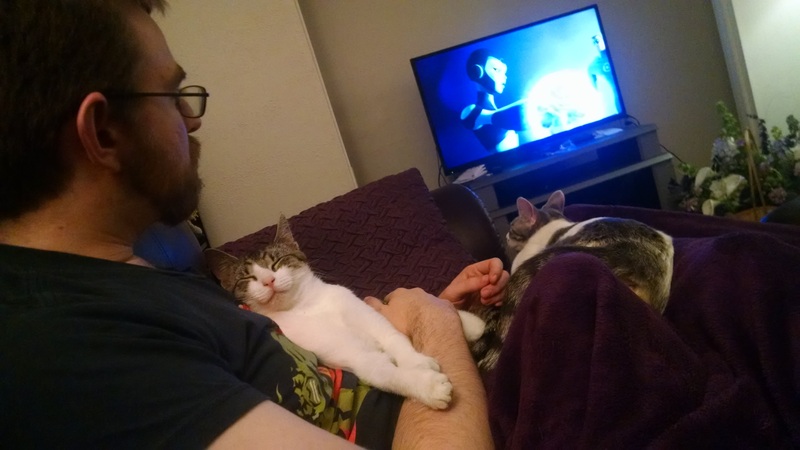 I don’t remember having vocal cats before them, so this is a new experience for me and my husband who came from a house of very quiet cats. Calamity and Pearl like to talk. They will very happily announce their presence with these sort of chirping meows as they trot into the room with a toy in their mouths. If I’m in the bathroom they will cry at the door to see if I’m in there. Pearl also enjoys playing with feet under the door. If they just want to know where I am, they’ll wander the house meowing for me. It’s pretty sweet actually. I just wish they wouldn’t cry outside the door in the morning. As mentioned above, they are super energetic and they can’t calm down enough to sleep with us at night. We tried that the first couple nights and quickly decided we liked sleeping without getting attacked every half hour more than we wanted to snuggle with the kittens for five minutes at a time. So we close the door to our bedroom at night and the kittens find it very distressing, especially when they’re hungry in the morning. They are very persistent when they’re hungry. Aside from the unfortunate position they’ve taken up as our new alarm clock, having kittens has been great. I currently have a Calamity cat curled up beside me. She’s also sucking and kneading on my fuzzy blanket, but you know. I enjoy getting kitten cuddles throughout the day. 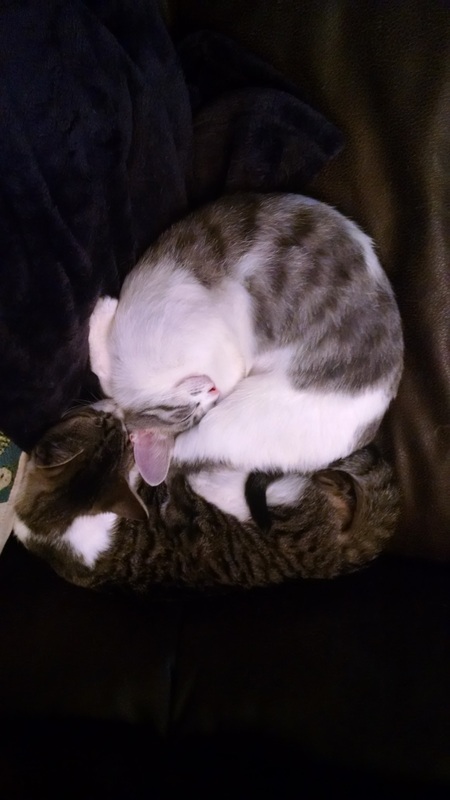 Our kittens cuddle in very different ways. Calamity is a very in-your-face cuddler. She needs to be up on your chest, near your face, under your chin. She likes to be up close to you, even when you’re in a more vertical position than will allow for that. She’s the kind of cat who goes up on her hind legs to be picked up for snuggles. Pearl on the other hand, is a more aloof cuddler. She’s likes attention, just on her terms. She’ll come calling when she’s in the mood for some pets and will pick her spot based on how she’s feeling. She is most often fond of sleeping on my feet, or awkwardly draped across my lap. 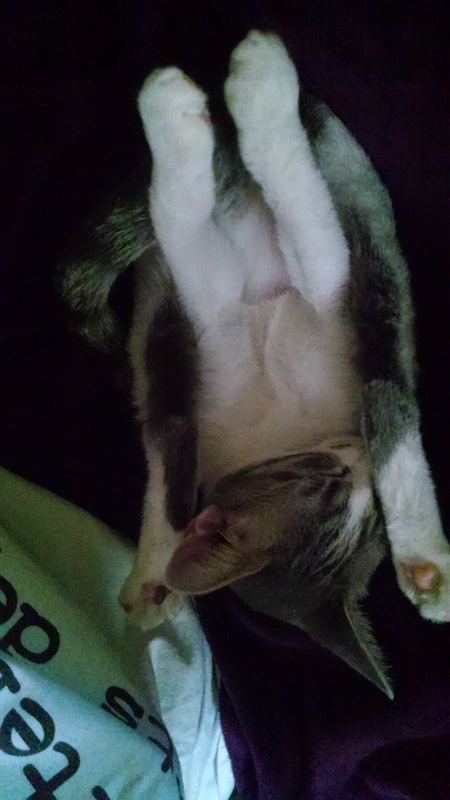 She has a thing for laying in weird positions. We’ve finally figured out how to feed our kittens. At my in-law’s house they were free fed, but our kittens don’t seem to have the self control required for such things and it may have been contributing to Calamity’s multitude of issues. So after another trip to the vet, we started feeding them just as much as they’re supposed to have. Dry food in the morning, no food until the evening when we give them a can of wet food and Calamity gets her probiotic. They actually sit and eat all their food at once now, which is good, but they are also a little mad that there isn’t food for them all the time. I feel a little bad about this, but as we haven’t had any more issues since we switched to the feeding schedule I think they’ll get used to it. I forget sometimes that cats are tiny creatures and don’t need nearly as much food as we do. We have some pretty special cats. 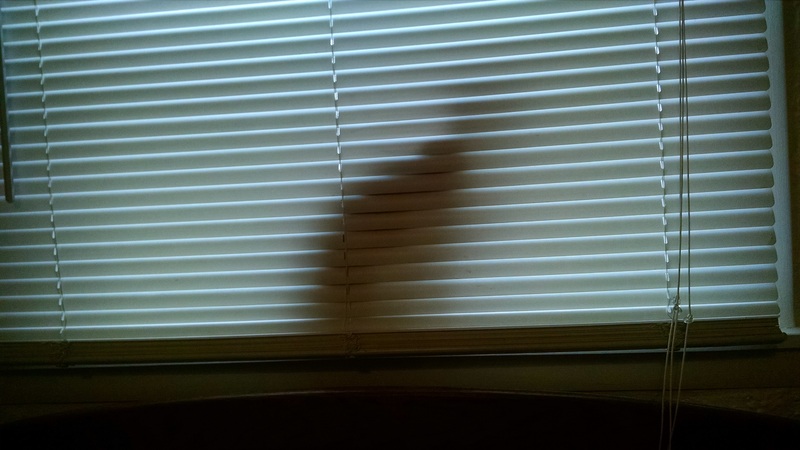 Pearl learned pretty quickly that she could go behind the blinds to look out the windows. Calamity has yet to figure this out. She just sits and marvels at Pearl’s silhouette. Pearl likes to play around things. She’s sitting right now behind the folded up step-stool and playing with a hair tie around the rung at the bottom. Calamity is obsessed with sucking on soft blankets with as much of it in her mouth as she can fit. She also likes to eat my wood-wick candles. They both like to eat weird things. Pearl is into paper, though I don’t know if she actually eats it or just likes tearing it up. We often have to ask them what they’ve found and if they should be eating it or not. I’m waiting for them to pick a fight with the wrong spider. Regardless of their quirks, they are our special cats and we love them very much. Life is certainly more interesting with kittens.